Two-packs are a tricky business. Sometimes they can really help a line and sometimes they can hurt it. Fortunately, with the writing on the wall of declining sales DST pushed through three packs towards what is the probable end of their Battlestar Galactica line to get out some highly requested, and very necessary characters. Easily the most exciting of the batch is the only set to include two all new characters to the line - Colonel Sol Tigh and Lietenant Felix Gaeta. Best friend of Admiral Adama and Executive Officer of the Battlestar Galactica, Saul Tigh fought the Cylons for decades before ultimately learning the truth about his own origins - a revelation which almost destroyed Tigh and Adama both. Tigh is one of my favorite characters of the last 10 years. Michael Hogan's slow, gutteral cadence turned the "broken goods" alcoholic into an equally resolute and vulnerable man in charge who probably shouldn't have that much responsibility. During the horrible New Caprica storyline (yes, I'm that guy - New Caprica ruined what was good about the show and literally kept it moving: it was a chase. At New Caprica literally everything stopped and the show took a self indulgent turn to blatant commentary on the Iraq War) Tigh lost an eye (oh - I'm also a poet), and while they didn't go the route I was hoping for Tigh + Eye Patch led to some cool stuff. 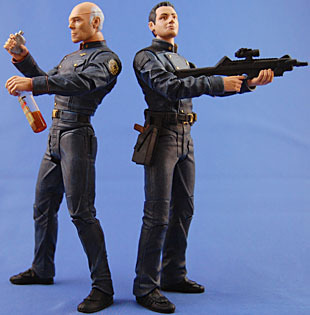 Tigh spent about 35% of the show with the eyepatch and the first 65% without so it was actually a big debate about which version would go in to the two-pack and which would become a Toys Я Us exclusive. Despite all the marketing showing the two-pack to have the bi-ocular head, it ultimately came out monocular. Sure I would have preferred two eyes over one, but I'm just happy to have a Tigh. 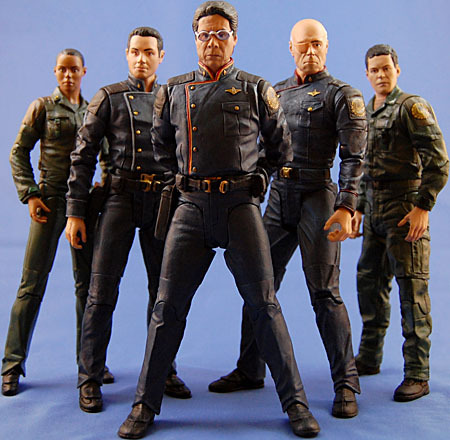 The figure is a repaint of the Duty Uniform Helo that was an Action Figure Xpress exclusive, with only the new Head and paint to separate it. Fortunately the two men are roughly the same body type so nothing looks out of place. Even with the eyepatch this is a great likeness of Hogan, certainly one of the very best likenesses in the entire line. The eyepatch on the show is a trimmed large bandaid and the sculpt here captures that perfectly, with the center of the patch raised slightly and pock-marked just like the real thing. There is only one thing missing from the figure and it's subtle, but you definitely can tell something is askew - there is no eyebrow above the patch. Even though its not obstructed on the show and it the brow ridge is visible in the sculpt it simply is painted on. Not sure why, but it is certainly missed. The paint, though, in general is very good on the figure, especially the eye patch string which is both sculpted and painted. Responsible for saving the Colonial Fleet on several occasions, Felix Gaeta's quick thinking and improvisational skills served him well as both Tactical Officer aboard the Battlestar Galactica and adviser to President Baltar on New Caprica - though his loyalties would later be put to the final test. Much like Tigh, Gaeta reuses a body previously released. In this case its Duty Uniform Apollo from the Apollo/Dualla two-pack. The sculpt remains very good and is a fitting choice for Gaeta, all things considered (all things being that the only way these characters were getting released was to keep production costs low and reuse as much tooling as possible and that Gaeta is roughly Apollo's body type, or at least more his than Helo's). The only new addition is also the worst thing in the set - the head. This is, unfortunately, just a bad likeness. He looks pretty generic and not much like Alessandro Juliani at all. As I look from figure to photo, I'm pretty confident that is a likeness completely lost in the paint. Juliani has a "puffier" head than what's on the figure, but not significantly so, so I don't think a better sculpt would do a whole here. Looking at the back of the card I see the prototype paint and bemoan whatever it was that caused them to cut the additional paint apps. Juliani has one of those great faces with unplacable ethnicity, and that's totally lacking here. He needs the darker lips and darker eyelids on the prototype. And eyebrows that aren't off-center. As it is, this figure just looks like some guy wearing too much makeup. DST has a reputation for being voluminous when it comes to accessories, and they do not disappoint here, with 12 different pieces! 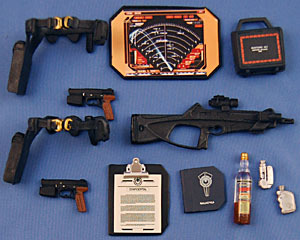 We get two gun belts with guns (the narrow holster and guns first released with Apollo in the Apollo/D two-pack), two flasks, a liquor bottle, a clipboard, a rifle, a Munition Key box, a draedus screen and a Galactica log book. And of all of that, the flasks, bottle draedus, book, and box are all new pieces. Oh man, oh man, oh man! The liquor and flasks are especially appreciated for Alchie McLush Tigh, and everything really helps pad out the display and figures. Oh DST, at least you're awesome at accessories! But, I must say I would easily give up a couple of these if it meant you could have afforded the extra paint to improve the two likenesses. As cool as accessories are, the likeness is of prime importance. When this set was announced there was some hemming and hawing about Gaeta, that we were getting a second tier character before the many first-tier characters and variants we all need and want. I was thrilled though: I'm a big fan of ensemble casts and Gaeta is a big part of that for BSG - an important face of the bridge crew and a crucial figure in the over arc of the show. I for one am happy to have, even if he is flawed. As I said, Tigh is one of my favorite characters of all time so any Tigh is a good Tigh, but I while I wanted Eyepatch Tigh, we need Two-Eyed Tigh. Since its only a head swap it is my distinct prayer that DST will get him out somehow. 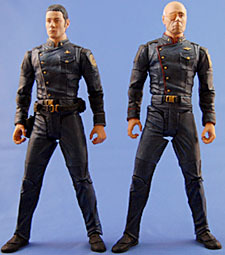 Either more two packs (how about a "Power Battle" between two-eyed Tigh and Tank Top Starbuck) or as an exclusive to a convention, we just need more BSG figures and I have faith that DST will find a way to get them to our hands.